“How did the kids enjoy the Sedona, that’s the most important thing I wanna know!” Missi and I were asked by a genuinely interested, and rather energetic Michael Sprague, Kia’s Chief Operating Officer and Executive Vice President in New York City. Luxury, technology, handsome styling and even great handling aren’t attributes you’d normally associate with a minivan. The 2015 Kia Sedona is one of the newest players in the minivan arena dominated by Toyota, Honda and Chrysler, and while the Sedona’s predecessors left us wishing for more, the 2015 model has over-delivered. Missi and I had the opportunity to transport our kids in luxury and style aboard a 2015 Kia Sedona SX-L from our home in Indianapolis, Indiana, to New York City. Curious to know how it turned out? As a typical male, dad, and husband, I’ll be the first one to tell you that minivans aren’t purchased for their looks, they are brought into a home because of their incredible ability to haul full size humans, tiny humans and a lot of cargo. That being said, the 2015 Sedona is hands down the best looking minivan for sale today. It is a styling movement that Honda started with the Odyssey back in 2005, when they decided to make the first good-looking minivan and they corralled the entire market share. The Sedona has a bit of a rugged but luxurious look. If you pay attention to the ride height, you will notice it sits a little bit higher off the ground than the rest, much like a cross-terrain vehicle. It also has strong, muscular lines, and a headlight and grille combination that could very well wear the Bentley badge. LED lights, 19″ wheels, and a muscular stance separate the Sedona from the rest. Power sliding rear doors, liftgate, and even side mirrors make everything a effortless. Maneuvering the 2015 Sedona is cake, thanks to its tight turning radius, and even Missi managed to park the 201.4 inch Sedona into a parking spot, although she did rely on the high tech surround cameras to avoid hitting stuff. But then again, that’s what the technology is there for, to help us! The cameras and parking sensors came in very handy while driving and parking around New York City, as it seems that everyone is out to scratch and scuff your bumpers. Once on the highway, the 2015 Sedona is very light at the wheel, and the 276-hp 3.3 liver V-6 propels you with creamy surge of power reminiscent of European power plants. I’ve driven a Mini Cooper S through the Pennsylvania mountains on I-76, and now I’ve driven the Kia Sedona through there as well, and only a lunatic would say it was just as much fun. But when you consider the 600 pounds of luggage and four total passengers, it puts into perspective how well the suspension, steering and overall dynamics of the Sedona work in harmony to create a driving experience envied by others in its segment. A feature that Missi and I are over the moon about is Kia’s Smart Cruise Control, which like the rest of the technology in the 2015 Sedona, it was simple and easy to use. Turn cruise control on, set your speed, then you have the option to use or not use Smart Cruise Control — Use it. Then simply tell the system how close you want to follow the car in front of you. I went upwards of one hour and thirty minutes without having to override the system with the pedals. Over the years I’ve thrown many tantrums because someone cut me off right after I settled into a nice rhythm with cruise control on. Then you have to slow down, cancel cruising speed, then speed up and re-set the speed all over again. Well, say goodbye to such shame — it’s amazing! But perhaps you’ve reached admiral level on your frequent flyer program with United Airlines and primarily travel first class. And perhaps, for some unknown reason, this time you chose to mingle with the mortals that travel by road. Then Kia’s first class lounge seating is for you, Sir (Or Madam)! In this case, it were our kids that lounged in the first class accommodations for most of the trip, and they loved it, it must be the reason why they slept for 80% of the trip. The 2015 Kia Sedona offers front, back, left and right sliding second-row chairs with armrests, cupholders, and even leather leg rests, yes — leg rests. There is room for a total of seven passengers, and even the third-row offers ample leg room as well as protection by the full-length side curtain airbags. Sadly the third-row folding mechanism is the Sedona’s weakest point. It’s clunky, confusing, and the seats are heavy enough that Missi had a hard time folding them in or out. 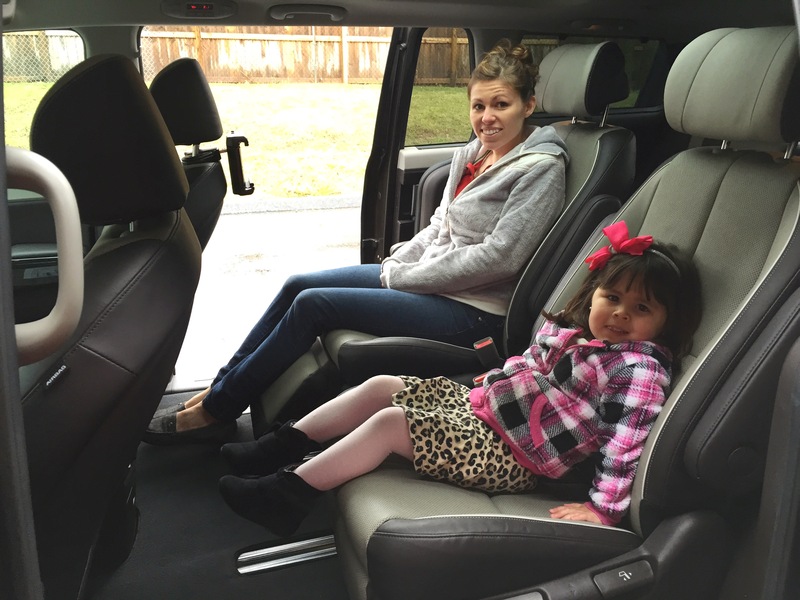 Missi and Josephine were the first to explore the executive seating upon delivery. Stowing the third row is a pain, but once done, cargo space is abundant. We all enjoyed every minute in the 2015 Kia Sedona, and I can promise you that’s not a simple task to accomplish over a 1,600 mile, 23 hour round trip. We love the fact that Kia dealers, engineers, and executives like Michael Sprague have listened to their customers, gone back to the drawing board, and boosted overall quality, finish, and brand perception way, way up. We have a feeling they understand that it’s not in the awards, the statistics, and even the balance sheets that build customer loyalty, as those will come and go and fluctuate due to a thousand variables. We were most impressed and pleased by the fact that they care about their customers, and their customers’ kids. 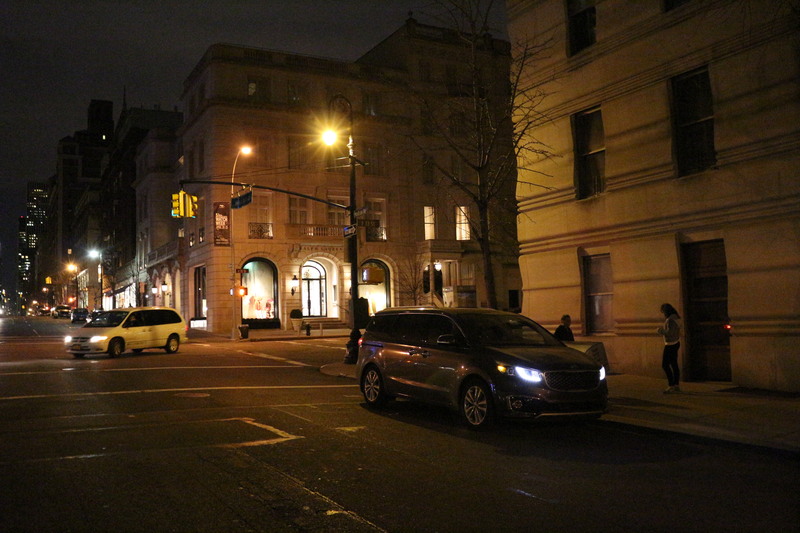 Parked on the famous Madison Ave. in New York City. 10 years. 100,000 mile warranty. Incoming call ringtone (think 80’s Atari). Conversation mirror, aka “kid monitor” is too small to see clearly.